In the Milwaukee, Wisconsin, area, Dr. Paul Loewenstein is widely considered the plastic surgeon of choice by both his patients and his peers. Dr. Loewenstein has over 34 years of experience in plastic surgery, and was recently voted as one of the top plastic surgeons in the country by the Consumers’ Research Council of America. Dr. Loewenstein received his undergraduate degree at Stanford University in 1972, then earned his medical degree from Indiana University in 1976. He went on to complete a general surgery residency and a plastic surgery fellowship through Indiana University Hospitals. 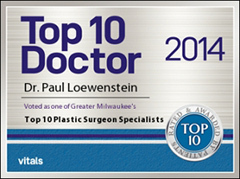 Dr. Loewenstein is part of Greater Milwaukee Plastic Surgeons, S.C., in Brookfield, WI. Dr. Loewenstein was recently recognized as an IDEAL IMPLANT Premier Surgeon due to his extensive expertise working with IDEAL IMPLANT® Structured Breast Implants, the latest technology in breast augmentation. The IDEAL IMPLANT is a structured saline implant with a unique structure of nested shells that hold the saline in place. With the IDEAL IMPLANT, women do not have to compromise their peace of mind to obtain their desired look. There is no risk of silent rupture, so expensive MRIs are not needed to detect a leak. Dr. Loewenstein appreciates that with the IDEAL IMPLANT, the incidents of capsular contracture are extremely low compared to other implants on the market today. The IDEAL IMPLANT also has a lower risk of ruptures when compared to silicone gel implants. Dr. Loewenstein’s patients acknowledge his medical expertise and his commitment to surgical excellence. 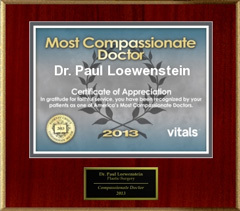 In fact, Dr. Loewenstein’s patient ratings are so high that he was honored with the “Patient’s Choice Award,” given only to doctors with near-perfect patient ratings. He has an exceptional bedside manner and a warm approach to patient care. Dr. Loewenstein is a doctor dedicated to achieving beautiful, natural-looking results. If you’re considering breast implants or any other type of cosmetic surgery, book a consultation with Dr. Paul Loewenstein today! Call 800-614-5097 or visit http://www.drloewenstein.com/ to find out more information about the IDEAL IMPLANT. Why Choose IDEAL IMPLANT Breast Implants? "I would highly recommend him!" "He is a superb surgeon!" "Very professional and extremely knowledgeable!" "An exceptional, thoughtful and talented surgeon"